Very little is known about Roger Bassett, who married Ann Holland and died shortly after their son was born. It is assumed he was their only child. Hugh Burt and his first wife, Ursula, married and had eight children, at least three of whom died in England as infants or children. 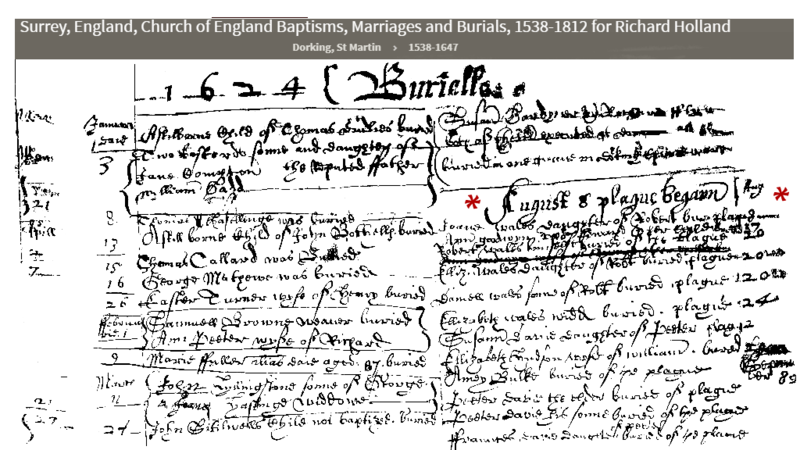 Ursula Burt was buried 43 Oct 1628, and widow Ann Holland Bassett married Hugh Burt sometime after the date of her burial and Jun 1635 when they registered for passage on the Abigail. Hugh (35) and Ann (32) Burt registered for passage on the Abigail with Hugh’s son Edward (8) and Ann’s son William (age 9 and the only Bassett on board ) on 17 Jun 1635. The Abigail sailed from England to Massachusetts in that year. Hugh Burt, Jr. at age 15 was registered on 1 July 1635 by Shipmaster Robert Blackwell for the same passage. Other researchers have concluded that the ages given on the log may have been incorrect by a few years since Hugh Burt, Sr. according to Salem Court records, should have been about 44 years of age at the time. The Dorking they left had been experiencing the Black Plague since at least 1624. Ann's father was buried that year, and in the church register, we see the records of the first deaths due to plague. Whether any of the Bassetts or Burts were affected by the disease is unknown, but the deaths of so many of his children and both their spouses leaves no doubt of the perilous times in which they lived. Hugh's son, John Burt, elected not to accompany his father to the New World, and died at 18, not long after they left. The mystery child is Sarah Burt, who has neither a baptismal record nor a record of passage on the Abigail, but she subsequently married her step brother William Bassett, and they are our direct ancestors. The Burt family settled in the Massachusetts Bay Colony, and Hugh Burt’s name appears among the original inhabitants of Lynn, who were given land in 1638. He received 60 acres, and was known as a "husbandman" (farmer). We will give some details of Ann's second husband Hugh Burt as it is with him that she spent the majority of her adult life. Hugh was baptized in Dorking, Surrey, England on 9 Aug 1590, and was the son of John Burt. He married Ursula (surname unknown) by 1614, when their first child's baptism was recorded. A little of the lives of Hugh and Ann Burt after they arrived in Massachusetts can be gleaned from the various court records of the time. Ann was sued on 25 Sep 1638 by Isaac Disberoe of Lynn. Hugh Burt answered for her in her absence, and neither the charge nor the outcome were recorded. Hugh Burt of Lynn counter-sued Isaac Disberoe on 24 Sep 1639. The case was continued until December, but again the outcome was not recorded. Ann was in trouble again in Dec 1643 when "Auld Churchman of Lynn" was presented for living without his wife for seven or eight years, and "for having the wife of Hugh Burt locked with him alone in his house". A few months later on 4 Aug 1644, Hugh Burt appraised the estate of this same Hugh Churchman, in whose will Burt's son Edward was bequeathed 10 shillings. On 26 Mar 1661, Hugh Burt, then aged 70, deposed that he had lived in Lynn about 25 years and remembered the purchase of land by Richard Longley. In Nov 1661, Hugh Burt was expected in court to witness against Hugh Dickman for absence from public ordinances, but the court noted he did not come because "Hugh Burt was dead." Hugh Burt died on 2 Nov 1661. His will dated 7 Oct 1661 and proved 26 Nov 1661 mentions "my son Will Bassitt". This mention is to the genealogists proof that Hugh Burt and Ann Bassett had married, although no record of the marriage has been located. He signed his will indicating at least a minimum ability to write (Ann made her mark on his will, indicating that she probably could not). The inventory of his estate totaled 143 pounds, 4 shillings, 9 d, of which 75 pounds was in real estate. The court appearances cited above before Hugh Burt's death were of much smaller significance that those which plagued his widow. We know from the later records that Ann had talents as a midwife and nurse and offered these skills to her community. "Bethiah Carter, aged 23 years, deposed that she heard Sarah Towsan say when she was a maid & lived with Goodwife Burt, that the latter told the said Sarah if she could believe in her God she would cure her body and soul, but Goodwife Burt said she could not cure her own husband because he would not believe in her God, but her maid did and was cured. Since then the said Sarah has been sorely afflicted with sad fits 'Crying out and Rayling agaynst me sayin My father carryed me to boston but Carryed her to Lin too an auld wich'. Sarah told her further that she had seen the said Burt appear often at her bed's feet in the day and night." "Phillip Reade, Physician, aged about 45 years, deposed that he had been sent for several times to see Sara Townsan and her sister Carter, both being very ill. 'Sd Sara townsend being in a more sadder Condiccion he had noe oppertunyty to Examine her Condiccion but did playnly perceive there was no Naturall caus for such unnatural fits but being sent for the 4th time and finding her in a meat Capassity to Give information of her agreunac and Caus of her former fits she tould me the above sd Burt had afflickted her and if ever she did Relate it to anyone she would afflict her wors one however after had a sadder fit than evar sha had afore: then I askt her who afflict her Now abd what the matter was she Replide with a great scrich she had tould me already and she did Now Suffer for it.' "
"John Knight, aged about 47 years, deposed that he 'was goinge to fetch some things for his wife and he saw old goody burt coming out of the swamp and shee was in her smok sleeves and a blake hancacher and black cap on her head and hee looked upp and suddenly shee was gone out of sight and I looked aboute and could not see her, when I came into the house I found her in the same habit as I saw her and he said unto her did I not see you in the swamp even now and she said noe I was in the house and he tould her she was a light headed woman.' "
"Maddelene Pearson, aged about 50 years, deposed that she heard Sarah Pearson say when her father had her down to Goodwife Burts to be cured of her sore that the first night she was there the said Burt put her to bed..... Burt said 'Sarah will you smokit and giving of the pipe she smokit', and Sarah fell into fits again and said Goodwife Burt brought the devil to torment her." Apparently no action was taken against Widow Burt as a result of these charges. However, some of William and Sarah Bassett's children were not so lucky. Their oldest son William, Jr.'s wife Sarah Hood was tried at Salem on 23 May 1692 and was sentenced to Boston prison where she was kept until 3 Dec. 1692. Her daughter named Deliverance was born while she was being held in prison. She later received 9 pounds as compensation for her false imprisonment for witchcraft. Their daughter Elizabeth's first husband John Proctor was hanged for wizardry during the Salem Trials on 19 Aug. 1692, based on the testimony of Mary Warren, a servant in their household. Elizabeth was also found guilty of witchcraft, but was given a reprieve "on account of her peculiar circumstances" or until her child John Proctor, Jr. could be born. She was eventually given restitution for her prison stay of 150 pounds in 1703. John and Elizabeth Proctor were the central characters in Arthur Miller's play (and subsequent movie) "The Crucible" and are also described in the book "The Devil in Massachusetts", by Marion Starkey, written in 1949. William and Sarah's daughter Mary was also accused of witchcraft and was sent to prison in Boston on 23 May 1692. At the time of her imprisonment, she was a widow and was given 9 pounds as compensation for her prison stay. Ann Burt also left a will, which was dated 8 Jan 1664 and proved 26 Jun 1673. In it, she leaves her various household belongings to her son William and her grandchildren. The inventory of her estate totaled 47 pounds, 2 shillings, 6 d, including no real estate.